Seven Seas Waterpark, the largest of its kind in Mindanao, is setting its sight not only on domestic clients but foreign tourists as well. Resort operations manager Roselle Machate said they had already seen bookings from Chinese and South Korean tourists as early as next year. “The whole point of building this theme park is not just for domestic tourists; it’s really intended for the international market,” Machate said during the grand opening of Seven Seas over the weekend in Barra, Opol, Misamis Oriental. "We are competing with other water parks in the Asia Pacific," Machate added. 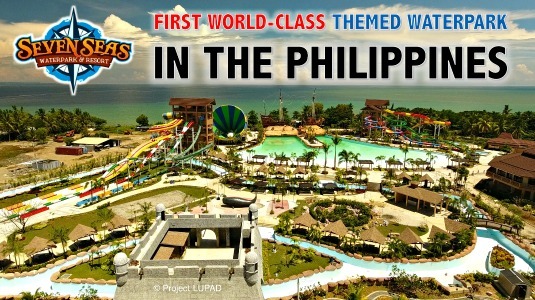 Transforming a seven-hectare marshland less than five years ago into what it is today, Seven Seas now boasts of the The Cyclone, the largest water slide in the country, a vertical aqua loop water slide called Plank Drop, among many other attractions. May Unchuan, director of Department of Tourism in Region 10 (DOT-10), said the presence of Seven Seas would boost foreign tourism in Mindanao, which she said had been hit by travel advisories from Western countries following the Marawi conflict. Unchuan said Russians are also a potential target for the themepark, whose leisure activities in the region include diving off the waters in Gingoog Bay. “These tourists are the younger ones, they don’t care about the travel advisories. They can certainly boost tourism since they appeal to other adventurous folks like them,” she added. Seven Seas Waterpark proprietor Elpidio Paras said he is also planning to put up a hotel in the area within the next two years. With the culture, traditions and flavors of at least six Asian nations as its main highlight, a first of its kind theme park will soon rise in this renaissance city to give quality family entertainment not only to the people of Bulacan but also those from other provinces. Mayor Natividad, for his part, said that this business endeavor will help boost the tourism potential of the renaissance city of Malolos because of its rich cultural ties with other countries even before the Spanish colonial period. “People won’t have to go to South Korea, Hong Kong, Singapore, Japan and Thailand. They will just have to visit the Chimera Land theme park when it opens by December this year,” Natividad said. According to the Sta. Ana siblings --Carlo and Christian—the theme park will have an airplane at its entrance where visitors can board and have photo opportunities before descending on the compound of Korea, Japan, Singapore, Thailand, Hong Kong and the Philippines. Visitors will have the opportunity to taste the flavors and the culture of said nations after alighting from the “airplane at our gate which will have its own “flight attendants and pilots," they said. Sta. Ana added that it will be built to suit the needs of students because of its educational package tour.